Assure Hair Reviews - Fuller and Thicker Hair? When applied to your hair, Assure Hair is a Patented Professional-Grade solution that promises to make it more fuller and thicker. This solution is intended for most hair colors including black, dark brown, medium bow, and dark blonde. A company called Assure Hair, suggests they have an instant solution to a condition that many people face at some time in their life – hair thinning and balding. What they offer is a product that is applied to clean, dry hair. All it takes is a simple shake or spray of Assure Hair fibers onto any area showing the signs of thinning, followed by a gentle pat to the head to allow the fibers to disperse evenly. Once that is done, gently brush, comb, or style the hair as desired. When Assure Hair is applied directly on to the hair, it's intended to eliminate the appearance of hair thinning and baldness instantly. Unlike other hair loss products on the market, this is not a type of paint or cream but rather a powder consisting of finely textured cotton fibers that bind to existing hair, forming a layer of “hair” just above the scalp. Both men and women can benefit from using this product, and it comes in four colors, black, dark brown, medium brown, and dark blonde. Although we didn’t test it ourselves, based on what we learned from the website, this product seems relatively easy to apply and doesn’t leave much mess. It is offering a hair loss “cover-up” that is resistant to wind, rain or sweat, that will not smudge, stain skin or clothes. The product is said to be made from natural ingredients, is easy to use, lasts all day, and washes out easily with regular shampoo. As the body ages, it is not uncommon for both men and women to experience balding, thinning, and hair loss. The cause of hair loss ranges from a variety of reasons such as age, poor nutrition, high-stress levels, a hormone imbalance, and general poor health. Many of these common causes of hair loss are avoidable or fixable just by making small lifestyle changes. However, one bigger culprit that poses a harsher condition of hair loss and one for which there’s no cure called, androgenetic-alopecia, where a hormone called DHT ‘attacks’ follicles until they cease producing hair. Experiencing hair loss can be a great deal for many, as it is an obvious one that is hard to conceal. It is a problem that sends most people in search of a solution or a procedure that may put a stop to their hair loss - or at the very least cover up the signs of it. So, what is Assure Hair exactly? Could it be a cure or solution for hair thinning or baldness? Do their claims offer any credibility? Does it have any limitations? 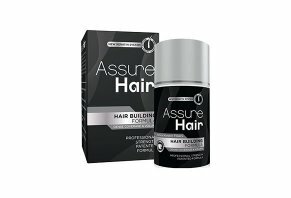 What Are the Ingredients in Assure Hair? Gossypium Herbaceum is commonly known as Levant cotton - a perennial scrub and a species of cotton native to sub-Saharan Africa and Arabia. The cotton fibers extracted from this plant creates a negative charge, causing a magnetic type reaction upon contact with positively charged hair. These cotton fibers are responsible for establishing that layer of “hair” above the scalp, creating an illusion of having a fuller looking head of hair by doubling up hair volume, and covering up balding and hair thinning. Can Anyone Use it – Are There any Limitations? There is hardly ever a “one-size-fits-all” that genuinely fits all, and in this case, Assure Hair does come with a few limitations that you may want to factor in before purchasing a bottle. The first and most apparent limitations are on hair color. If your hair is grey, red, or anything other than, black, dark brown, medium brown, or dark blonde, then this product might not suit you as it only comes in four colors. A common concern for many people would be how waterproof their product is. No one wants to walk out into the rain and have their product begin to drip down their face. According to the companies website, they claim that Assure Hair is long-lasting up to a couple of days and resistant to wind, light rain or sweat. They say that it will not smudge, stain skin, clothes – or the pillow! However, they do mention that it is not suitable to wear while swimming or when caught in a considerable downpour of rain, and they recommend carrying a travel size with you for touch-ups should this situation ever occur. With all of this said, based on what we’ve learned from customer reviews for similar products (more soon), we think it’s important to maintain realistic expectations about just how well these—or any other—hair fibers will stand up to wind and moisture. Considering this product is not a cream or paint, it is inevitable that it needs something to adhere to, and in this case, it does require a fair bit of hair. Additionally, this would indicate that if you are currently completely bald, then this product will most likely not work for you. As long as you have some hair for the fibers in the formula to stick to, then you will be fine. In fact, according to their website they say that it holds best to thin hair. How Much Does Assure Hair Cost? At the moment, Assure Hair can only be bought online from their website and other third-party websites such as eBay or Amazon. They offer a 100 percent satisfaction and risk-free guarantee, so you can receive a full refund within 30 days of your order. Available for purchase directly off their website, they are currently offering a 28-51 percent discount for three different packages on all four colors (black, dark brown, medium brown, dark blonde), including free priority shipping. Buy 2 + GET 1 FREE for USD $70.89 (51% off): Offering a supply of 2-3 months and saving you a total of USD 84.96. With a large variety of products on the market to compare with, we will take a quick look at three other products, “Toppik,” “Coboki,” and “Infinity Hair,” to see if they offer anything superior to Assure Hair. Application is the same, which works by adding to clean, dry hair, spraying the fibers around areas showing signs of thinning, patting the product in to disperse evenly, and then combing and styling as usual. As far as ingredients are concerned, Coboki uses the same natural cotton fiber hairs that Assure Hair uses. Infinity Hair also uses cellulose called “rayon” which slightly different to cotton. Both cotton and rayon fibers are natural sources of cellulose. However, the difference is rayon fibers are extracted from wood. Toppik uses naturally derived keratin similar to the protein found in human hair, although there is no specific mention of where it is directly sourced from. While we didn’t encounter clinical evidence during our research that any of these materials will deliver better looks or performance than others, we think a big factor to consider is the limitations of hair color. While Assure hair offers only four different shades, Coboki is available in five, Infinity offers ten, and Toppik is available in nine. Cost-wise, most hair fibers typically fall somewhere between $30 and $40 for a one-ounce bottle, making Assure competitively priced. Do Their Claims Offer Realistic Expectations? As far as we can see they are not implying anything “miraculous” with their formula. The company is not claiming a permanent cure to hair thinning and baldness or that their product will help regrow fallen out hair. They claim their product provides “instant natural hair thinning results” that will make you look younger and provide confidence in 30 seconds. However, does it have the ability to make it your hair look fuller, thicker and longer as they say? When it comes to offering complete confidence in 30 seconds goes, if you have the right requirements for successfully using this product such as the right hair color and the minimum amount of hair for it to attach too, then you may have found the solution to your problem. If all it takes is 30 seconds to apply and temporarily “fix the signs of balding and hair thinning,” then you very well may feel confident again to walk out with fuller, thicker looking hair. Will it make your hair look thicker and longer? Since this product involves binding a fiber onto your existing hair, then the answer is yes. Hair usually looks thicker and perceives to be longer with an increase of hair volume. Our research on this product indicates a temporary solution to cover up the signs of balding or hair loss through a collection of natural ingredients that is safe and easy to use. At this point, no claims are made about the product being a cure, a permanent solution, or to benefit the re-growth of hair. Whether or not Assure Hair works for you might require trying it out, and with a 30-day return policy, it may be worth your while to give it a try. Before purchasing any new product, it is essential to make an informed decision first, by researching the ingredients and any possible misleading claims. Write a Review for Assure Hair!